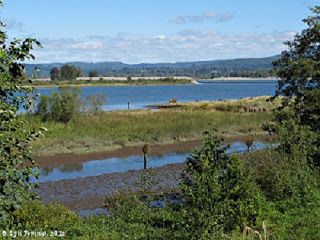 " ... a cool wet raney morning we Set out early ... " Lewis and Clark had camped at Prescott Beach, just below Rainier on the Oregon side and Kelso-Longview on the Washington side. This area of the river, other than where the dams were located, is the most changed. The mill at Longview and the bridge spanning the river speak to the commerce that has developed along the Columbia's shoreline. When Robert Gray sailed across the bar at the mouth of the river, only native villages dotted the shoreline. From Fort Vancouver, built in 1829, to Astoria, settled first in 1811, a number of small communities with their attendant commerce had begun to supplant the native villages. The industrial age had caught up with the Columbia. And with the discovery of gold in the interior Columbia basin and the development of canneries on the lower river, the die was cast. Two brothers, George and William Hume, were major players in the development. 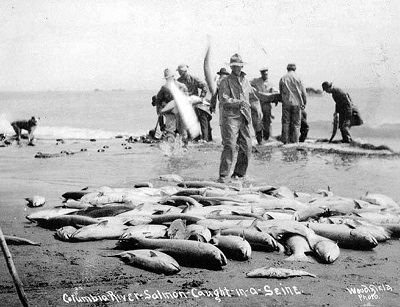 In 1866, with declining salmon runs on the Sacramento River in California, they packed up and moved their operation north to the Columbia. With their partner, Andrew S. Hapgood, they built a cannery located at a place they called Eagle Cliff on the Washington side some 50 miles upriver opposite the mouth of the Clatskanie River. That year they packed 4,000 cases of salmon, 48 one-pound cans to the case, all done by hand. By the 1880s, more than thirty canneries lined the river from Astoria to the Dalles, and 600,000 cases of packed salmon were shipped yearly. By 1911, just 100 odd years since Lewis and Clark, the salmon catch peaked at 47 million pounds. Increased boat traffic, from steamboats to double ended gill netters, created a need for a safe channel and aids to navigation. The river's seasonal rise and fall and its many shoals posed a challenge for the larger ships that began to sail up river. In 1877, Congress approved the creation of a channel from Portland to the mouth of the river. In 1891, dredging deepened the channel from 17 feet to 25 feet. 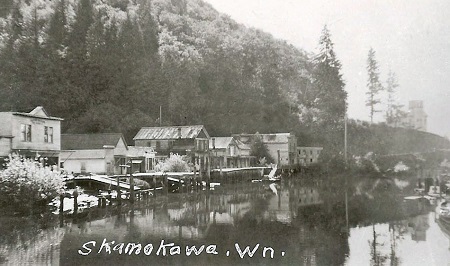 Skamokawa and the shoals at the west end of Tenasillahe Island mark the end of the river proper and the beginning of the Columbia's estuary. From Bradford (RM 41), once a booming logging town, across to the Elochoman Slough is just a mile and a quarter. Beyond Tenasillahe's western point, the Columbia widens to over six miles from Svenson Island in Cathlamet Bay to the mouth of Gray's River. 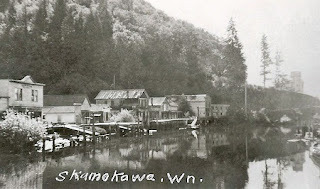 As with the character of the activities along its shoreline, the character of the river itself between St Helens and Skamokawa begins to change. Beyond the Cascades, across a wide plain, and through the less formidable Coast Range, the river slows and its course becomes dotted with islands, large and small. Their names speak to the nature of each island: Goat Island, Deer Island, Martin Island, Sandy Island, Cottonwood Island, Walker, Fisher, Hump, Crims, Wallace, Puget, and back to Tenasillahe. All these landforms are products of the vast amounts of sediment that the Columbia transports. A good deal of that sediment is deposited at the mouth creating the hazards of the bar. Much is washed out to sea. Known as the Astoria Fan, this asymmetric wedge of sediment is 6000 feet thick and extends over 60 miles out to sea. The most obvious product of deposition though are the islands. As a river meanders down its course, the flow on the outside of a bend will accelerate, and erode the corresponding bank. The flow slows on the inside of the bend, and this allows deposition of the silt, sand, and gravels carried by the river. One aspect of this corresponding erosion and deposition is the maintenance of a river's width. Often, an anabranch, or side channel, will cut a path through the easily eroded sediment and an island is formed.